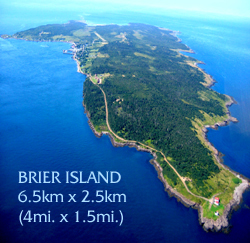 Welcome to Brier Island and Brier Island Lodge, Where the Bay of Fundy And Your Perfect Vacation Both Begin ! Brier Island is a rugged diamond in Nova Scotia's crown, home to an industrious seafaring people, an amazing variety of flora and fauna, and some of the best sunsets you will ever see! Marking the entrance of the world famous Bay of Fundy, Brier Island offers visitors the opportunity to explore one of the richest marine habitats and coastal environments in the world. Accessible by two short ferry rides from the end of Digby Neck, Brier Island offers a truly different pace of life for residents and visitors alike. The fishing boats still come and go as they have done for generations, the whales swim by as they have done since time immemorial, and the eternal tides rise and fall like clockwork. For those who are looking for an escape from hustle and bustle, it does not matter if you visit Brier Island in the warm sunshine or cloaked in mysterious fog - you can't help but relax and slow down while you're here. As Nova Scotia's eco-tourism destination, Brier Island is famous for it's whale watching, bird watching and coastal hiking. Reconnecting with Nature is very easy to do here; explore the miles of trails that criss-cross the island, see a coastal marine ecosystem in action at Pond Cove Beach or watch the seals sun themselves on the rocks at Seal Cove. Rock hounds can find quartz, agate, jasper, amethyst and even zeolite along our rocky shores. Being on the Atlantic Flyway Migratory Route, the area hosts hundreds of varieties of birds throughout the year.